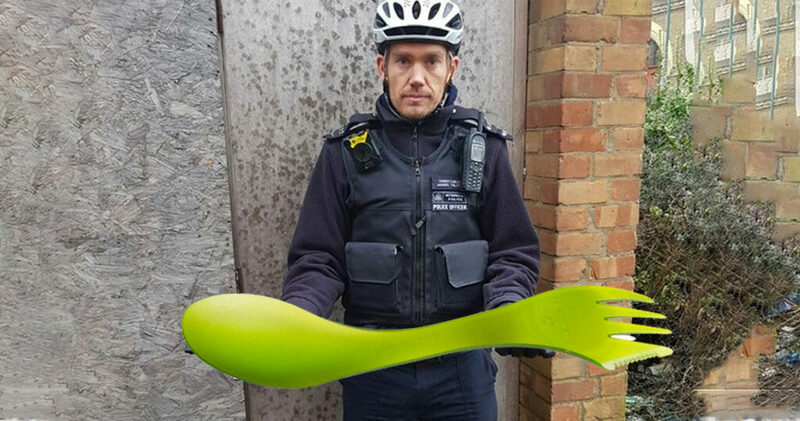 UK police stationed in Northumberland celebrated after a zero-tolerance raid resulted in the confiscation of one giant green spork (spoon-fork). Residents in nearby homes were shocked at the sight as they walked the deadly weapon out of the Cramlington home. The suspect in possession of the weapon said he was just using it for decoration and to feed his giant Great Dane dog. After a nation-wide knife ban, the Northumberland county authorities added sporks to the list of banned items—especially giant sporks. “There’s just no need for someone to own something like this,” the Police Chief said.